As we approach the one week anniversary of the El Reno tornado, there are a number of issues that we have not touched on. The first is the controversy because of a meteorologist with KFOR TV in Oklahoma City suggesting people "drive south" out of the path of the tornado and that if they were not underground they would die. He did this when it looked like the El Reno tornado would strike south Oklahoma City much harder than it actually did. Before we go further, KFOR TV in Oklahoma City is the successor station to WKY TV where I worked from 1971-1975. However, to my knowledge, I don't know anyone employed by the station at this time. The problem is it was the National Weather Service that first suggested driving out of the area that afternoon! Here are just some of the tweets from the National Weather Service in Norman. The definition of "suggested" is "to put forward for consideration." And, yes, at the time the NWS was suggesting driving away, the storm had not yet formed. To its credit, the NWS later said that "once the sirens sound, it is too late" to drive away. But, from where I sit, it is hypocritical for NWS employees to criticize others when the NWS was the organization that initially suggested driving away. For years, it has been an officially-stated goal of the National Weather Service to increase the lead-time (the interval from when a warning issued to when the storm arrives) for tornado warnings. The question I have asked, many times, is: To What End? When you are talking about 42 minutes of lead-time (which is what east Moore had on May 20) people without basements start thinking about alternatives beyond crouching in a bathtub with a mattress on top of them for three-quarters of an hour. It is scary to think about being home when a giant tornado strikes when you don't have a basement or underground shelter. I comment on my forthcoming suggestions at the end of this posting. Now, to the meteorologist's suggestions as the tornado was in progress. There is criticism about the TV meteorologists (not just KFOR) forecasting the giant tornado would hit south Oklahoma City. South Oklahoma City was hit but not by the giant tornado but a much weaker and smaller storm. This just reiterates my oft-made point that weather science does not have the knowledge or techniques to make these types forecasts of intensity and extreme location precision (i.e. which subdivision will be hit). A screen shot of the warning in its entirety is below. "You could be killed if not underground..." If it is "irresponsible" for TV station meteorologists to state this, it is "irresponsible" for NOAA to do it. This is the problem with the whole "impacts based warnings" program: It is attempting to do things we don't have the scientific knowledge to accomplish. As I have previously written about May 19, Wichita dodged a bullet. The tornado lifted right at the city limits. But, the fact is, this third "tornado emergency" in 13 months was wrong, just like the other two. In this case, there was no damage from a tornado, let alone "catastrophic" damage. We simply do not know how to predict when a tornado will lift as the May 19th storm did before reaching Wichita and the El Reno tornado before reaching Oklahoma City. To be clear, I'm not faulting anyone for warning Wichita and south Oklahoma City. Since we don't have the skill to predict when the tornado will lift, it was the right thing to do. But, that is why it is irresponsible to forecast catastrophic damage as the NWS did. I much prefer to praise the National Weather Service. I have written an entire book about their great work. Sunday, in the wake of the news of the deaths of the three chasers, I recommended we take a time out to let emotions calm. I reiterate that advice. I also recommend meteorologists stop their behavior of criticizing others for actions taken by their own organization. On June 24, at the American Meteorological Society's Second Meeting on Storm Warnings in Nashville, I will propose significant revamps to the tornado warning system. I'm certain that some will agree, some will strongly disagree and that it fine. What I am hoping to accomplish is to get the dialog started on how we improve on our already successful warning system without all of this consternation. Very well written, Mike. I whole-heartily respect and agree with your viewpoints. When the NWS first started experimenting with the harsh and strong language of a devastating tornado,(i.e, "You could be killed if not underground", "Complete destruction..", etc.) I though it was a good idea, at first. But these past 2-3 weeks have really changed my mind about the concept. Not all people have underground shelters. Therefore, they would HAVE to flee their house/area in order to find the nearest one. I wouldn't blame any TV meteorologist for saying such things, especially since NOAA/NWS are the ones who say it in their warnings. I DO have problem with them saying to flee from a tornado warned storm and a tornado that is within 10-15 miles of their location, some even closer. Like you stated, once the warnings and sirens sound, it's too late. Not to mention that this particular person from KFOR advised driving during rush hour on a Friday evening. I understand he was in a tough spot and wanted to prevent another May 20th (Moore tornado) incident, but by that time, it was too late. I believe you are safer in the safest part of your house, than on the road, trying to outrun a tornado. Even if the tornado happens to miss you, large hail and damaging RFD winds can still cause injury and even death. It's easy to blame and point fingers, and I wasn't trying to do that. Everyone makes mistakes. Maybe some don't consider this a mistake. However, I still think that the warning system needs to be altered a little, if not changed. Brian, thank you for the comment. 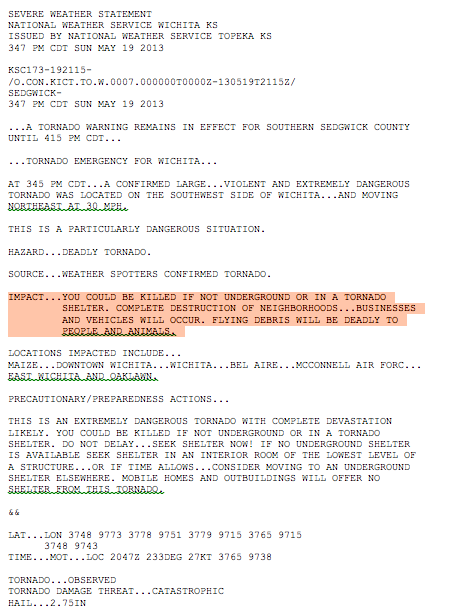 In Wichita, we have been told three times in 13 months the tornado would be "deadly" and that the damage would be "catastrophic." Wrong (thankfully!) all three times. Going forward, will anyone respond to an "ordinary" tornado warning?! Were mistakes made a week ago at this time? Yes. In retrospect, quite a few. But circular firing squads are not going to make the situation better. Let's chill out until at least the AMS storm warning meeting in Nashville. There will be plenty of ideas to consider and chew over and we can get started with the work of improving the warning system. It seems to me that just a few adjustments to the impact-based warning message would solve many of the problems you mention without compromising the urgency of the message. Take, for instance, the impact message itself. Instead of saying "You could be killed if not in an underground shelter," change it to "You are most likely to survive or escape injury in an underground shelter." This makes the point that underground shelter provides the greatest protection, without making it sound as if your situation is utterly hopeless if you can't get to one. Change "Complete destruction of neighborhoods WILL occur" to "MAY occur." In the precautionary/preparedness message, state "This is an extremely dangerous tornado. If it maintains its present path and intensity complete devastation is possible. Do not delay, seek shelter now!"... The first two statements accurately summarize the situation at the time of the warning, without stating anything that could be proven subsequently wrong -- it acknowledges the possibility that the tornado could weaken or change course, and that complete devastation might be averted. I really do like your proposed modifications. That said, the problem is that we simply do not have the scientific skill to, a priori, forecast whether a given tornado will be strong or weak, narrow or wide. The St. Louis tornado of May 31 was a rare leading edge tornado and those at F-3 intensity are VERY rare. We didn't get the "world is ending" language for it but it will have done much damage than the El Reno and OKC tornadoes of the same evening! The radar images that evening would have led to the reverse -- inaccurate -- conclusion. So, until the science improves, I believe we should treat all tornado warnings as "emergencies." We should urge people to seek immediate shelter. In that context, your messaging improvements make sense. The IBW controversy reminds me somewhat of the old saying about generals always fighting the last war. IBW, as I understand it, was instituted as a reaction to the Joplin tornado assessment and premised on the (inaccurate) assumption that the reason so many were killed in Joplin was because the NWS didn't tell them "get underground or die." Now, a "solution" meant to address a (nonexistent or at least exaggerated) problem from a previous tornado disaster is leading to further disaster. You are exactly right. The terribly flawed Joplin "Service Assessment" is doing a lot of harm, rather than good. My name is Stephen Dieli and I am not a meteorologist or a social scientist, however I live in Norman and watched first-hand the media coverage (KOCO) of both the 20 May and 31 May OKC weather events. Also, I follow(ed) @NWSNorman as well as @ounwcm (Rick Smith) on Twitter. In fairness I must disclose that I was outside for a portion of the coverage time and cannot confirm or deny that Damon Lane (KOCO) did or did not suggest people flee south as had the KFOR meteorologist. Semantically speaking, the NWS in Norman was doing nothing more than providing people with the general “in the car” guidelines for those in the general public that chose to follow the advice of the on-air meteorologist and flee the storm. From my perspective, it appears that sides are being taken here and that you are trying to divert the negative attention away from the on-air meteorologist responsible for this dialogue and suggesting the place of blame lies with the government agency tasked with providing weather information. This argument, in my opinion, will do more harm than good. It has the potential to handicap the NWS from using services like Twitter or Facebook that may hinder the warning process of future storms. There is no need to stretch the definition of the word “suggest” in order to form the basis for your argument. NWSNorman was doing nothing more than performing its civic duty by providing people with objective information on what to do in a tornado. The official stance is shelter in place, but with the KFOR meteorologist telling people to flee, the office was left with little choice but to reiterate the “in-vehicle” guidelines. These guidelines were the better alternative than silence. With regards to your argument against impact-based warnings, I agree with your stance. NWS Norman is not issuing impact-based warnings and so its an irrelevant point to this argument. KFOR’s meteorologist needs to come forward and accept what he said with either a public reaffirmation or redaction. Constructive dialogue cannot begin until he speaks on-air with regards to the 31 May KFOR coverage. I totally have the utmost respect for you and your experience. The whole idea of having 13 minutes of lead time to prepare is somewhat of a myth. Depending on the industry you work in, your ability to get the warning and react could be limited. We have teachers for example trying to teach class who really aren't able to keep their eyes glue to a computer or smartphone for warnings. Hi Stephen, respectful and constructive comments, even if they disagree with me, are always welcome! You wrote, "NWSNorman was doing nothing more than performing its civic duty by providing people with objective information on what to do in a tornado. The official stance is shelter in place, but with the KFOR meteorologist telling people to flee, the office was left with little choice but to reiterate the “in-vehicle” guidelines. These guidelines were the better alternative than silence." Your timeline is reversed. NWS posted about driving away first, KFOR did it later. I completely agree the NWS did not "encourage" fleeing by car but (as I read the definition) they clearly "suggested" it. The NWS could have remained silent. We can certainly agree to disagree on this. However, where I completely disagree with you is on the hypocrisy of NOAA employees criticizing the TV meteorologist about needing to be underground when their own organization is saying the same thing --and omitting that salient fact. If the TV meteorologist should resign (according to one NOAA employee) for saying people should be underground, then NOAA people should resign, as well. I have been a critic of this language since literally day one (see, from February, 2012, when the IBW experiment was announced: http://meteorologicalmusings.blogspot.com/2012/02/ka-boom.html ) and my fears have been realized.